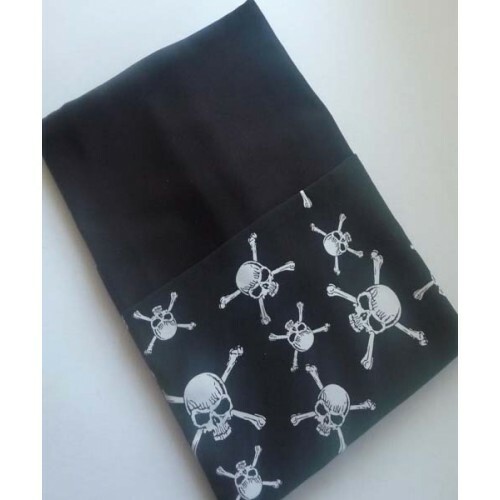 Skull designs are always a hit and this school chair bag from Pink Petunias is no exception. Manufactured in Australia from 100% cotton fabric this bag has been fully lined. Features white skulls on the pocket. Machine washable in cold water. Designed to fit straight backed school chairs. Available in 3 sizes. Design: White Skulls on Black. This Australian made school chair bag features a bottle green bag with an army camo pocket. Made fro..
An interesting school chair bag featuring a black bag with a leopard print pocket. Made from high qu.. This school chair bag features a black bag with a black and white Zebra print pocket. Made from high..
How cool is this chair bag? Features a black bag with white spiderwebs on the pocket. Made from high..
Black Cats are the feature on the pocket of this hot pink school chair bag. Made from high quality 1.. Featuring a dog print on the pocket of this black chairbag. Made from high quality 100% cotton texti.. Featuring a monster print on the pocket of this green chairbag. Made from high quality 100% cotton t.. Featuring a fruit print on the pocket of this hot pink chair bag. Made from high quality 100% cotton..
New design for 2019. Featuring feathers on the pocket of this purple chairbag. Made from high qualit..
New design for 2019. Featuring feathers on the pocket of this hot pink chairbag. Made from high qual.. Featuring a marble print on the pocket of this purple chairbag. Made from high quality 100% cotton t..
On the pocket of this chair bag we have a print centering on back to school supplies such as books, .. Featuring a monster print on the pocket of this aqua blue chairbag. Made from high quality 100% cott..